Most people love Lake Michigan. The historical map is one of many offered by greatlakesmaps.org, a collaborative project of Wisconsin’s Water Library, the University of Wisconsin Sea Grant program and other Wisconsin institutions. 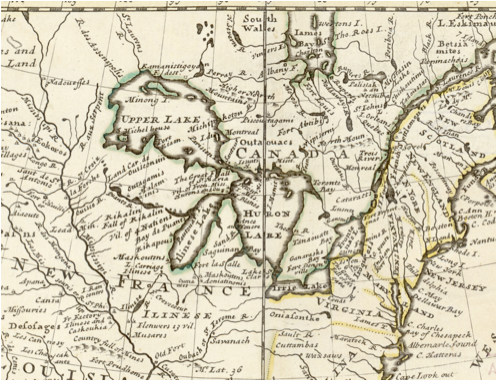 The 1711 map may not be geographically accurate – last time I checked Lake Huron wasn’t heart-shaped – but it’s revealing. The British crafted it in response to an earlier French map that minimized the nation’s holdings, according to the Web site. Moll became a popular publisher of American maps in his time. He’s probably the reason Lake Superior has such a huge ego. As for the lakes, depictions somewhat improved in time. See for yourself: There are 32 maps covering 300 years of mapmaking in the region and 76 historical lake charts from the United States Lake Survey. Note: Map files are large; it takes time to download.